Amiga disk magazine "Grapevine" produced and released by the group LSD. Since I could not find any good overview of the contents for this magazine elsewhere on Internet, I decided to screenshot every contents page to show the news headlines. You may download the .ADF Amiga disk images from Bitfellas Bitworld link provided at the bottom of page. Issue #01 to #04 has an awful article viewing so I started simply on Issue #5 and all the way up to the latest released which was Issue #21. 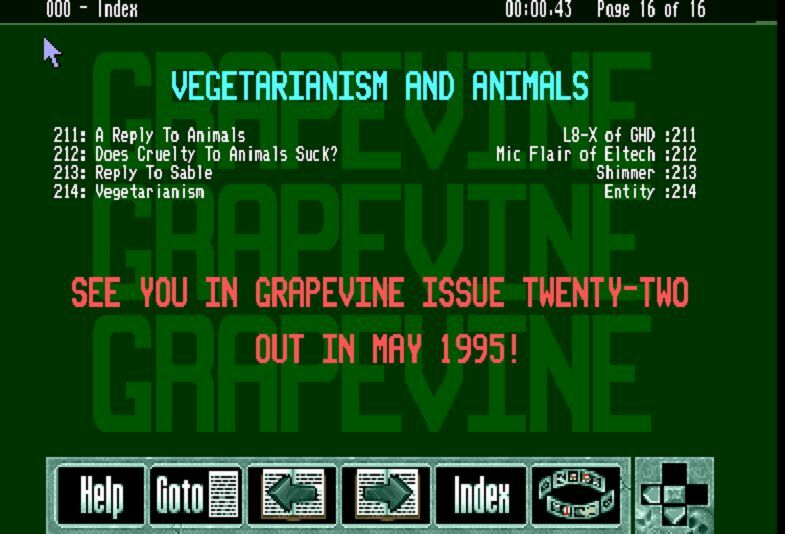 Funny enough it mentions Issue #22 at the end, but I have never seen that and possible it do not exists evenpossibly only half made. Would be nice to see that rare issue surface one day in future, we never know. The amount of information in these magazines are quite high and my screenshot ended up over 300 pages. I programmed a smart routine to convert white pixels with black background into real characters based on the screenshots I took from the disk magazines. 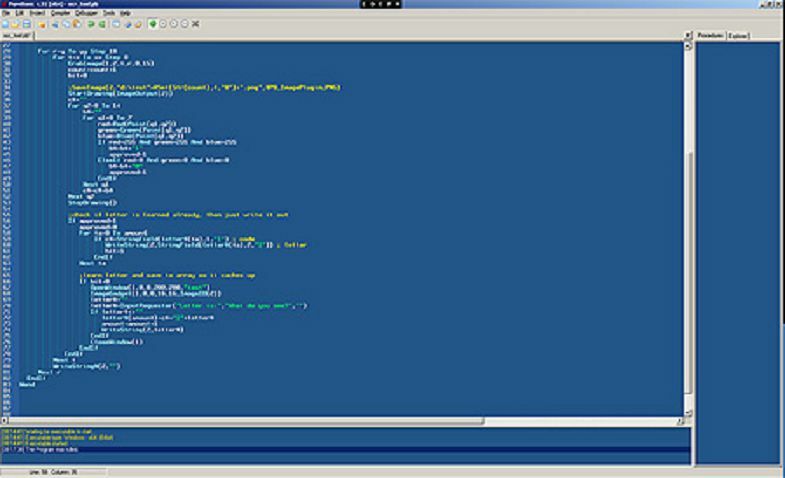 Also used in this project was Adobe Photoshop to convert all colors and background into black with the nice automation batch scripting available. It's similar to known OCR scanning used in Adobe Acrobat, but far far more simplified and concrete...not to mention my code is not very intelligent. Haha, don't matter as long as it works for what I want, who cares. 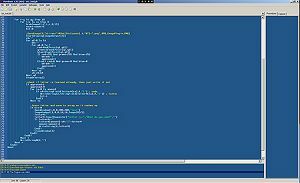 An area was defined in my code where the x, y, x2, x2 rectangle of headers was before executing the show. When a letter was recognized I had to write what I saw, which then was cached and used the next time the same character was detected slowing learning as we go along converting all screenshots on the fly into text output just as it appear on screen. Neat. I'm a sucker for automation within the computer and physical world! I can say that I was inspired by my programming on Commodore 64 in the mid 80's concerning sprites drawn on a grid paper during school hours... I even have the sprites that I drawn on paper...I have repainted them with a pixel software and upload them into my "Nostalgia/Commodore 64 Stuff" section of my website. The end result is an extraction of human readable text making it searchable as well as being picked up by Google. 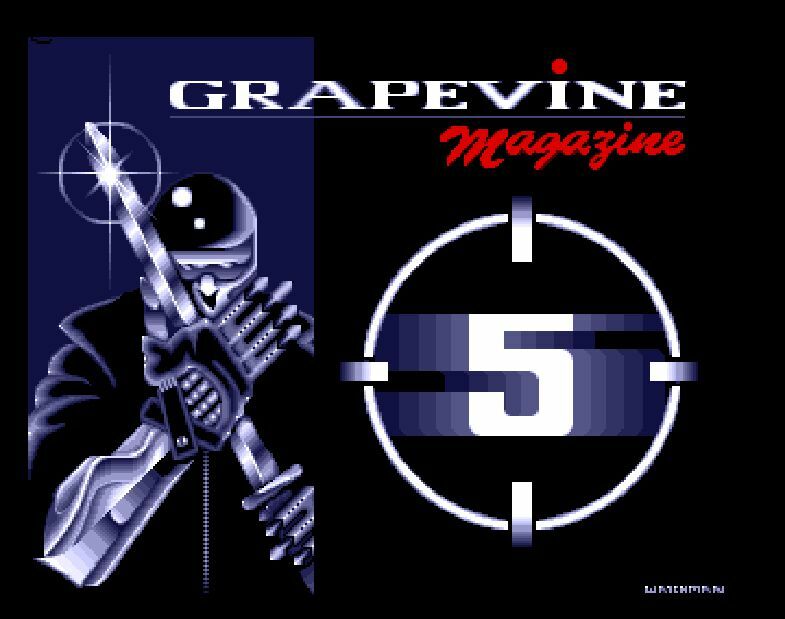 It might prove useful for other Amiga fans out there to go back into Grapevine's history of articles (headers for now). A lot of interesting and useful stuff is written here in the golden days of Amiga times. Not only that, but I want a fast way to determine where an article is located instead of looking at screenshots or booting up every disk....that is just too 90's I'm afraid. We need to mix old with new to get a convenient result! In time I might even go so far to convert every magazine into articles again, but for that I need to automate the process even more. 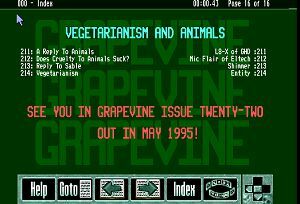 For now, enjoy my automated madness for the headers of all Grapevine magazine at least! Note: Since sometimes font designers forget the obvious fact that O (the letter o) and 0 (zero) should have a difference like a line inside the circle, some part of the actual text where there should be a 0 (zero) it will instead read O (capital) as there is no pixel difference between those two characters and almost impossible to detect without human manual interaction. Sometimes the O and 0 have difference in width (like in this document O0), but even that LSD didn't do. So that's life. It does not however apply to all screenshots, only a few or even just 2-3 issues.